MEXICO CITY (Reuters) - A lion and a tiger kept as exotic pets on the roof of a Mexican meat processing plant killed a man feeding them Monday, Mexican media said. Caretaker Angel Aguilar, 56, was taking pieces of chicken to feed the two big cats when the lion swiped at him through the bars of its cage and pulled him inside, Reforma daily said. The tiger then joined in the attack. Like the heading says: NATURAL SELECTION. The label under the photo says: Stomach full, eyes closed, an Afrikaans saying normally uttered after a big meal. The tiger knew what he wanted and it was not beef. 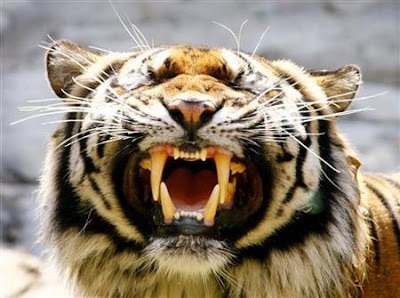 Four out of five Mexican tigers and Mexican lions prefer cabrito over pollo. And at a meat processing plant, no less. Schweeet! Makes sense; why would a large predator want chicken bits when there's some fresh long pig available? Maybe if he bought her a drink first? Oh. Sweetums. They would LOVE Artie the Psycho Kitten that our oldest has. Our ancient cat might be intimidated. New kittens? Cute little things. It should be illegal to be that cute. On the project that I am working on we have to divert a big river. The above pic's are of the diversion channel. The DC is 8 km (5.3 miles) long, 50 m wide and 3 meters deep. That makes this anthill more than 30 ft tall. This is also typical of a construction crew chasing production and leaving the tough bits for later. guess they are waiting on a truck load of government regulated ant-eaters to clear that area. Tough stuff that ant spit. I've heard those things can be hard as concrete. What'll you do? Dynomite it, leave it for the new river to desolve it, bulldoze it again? KK: Hi K-nine. Yes the are hard but with todays equipment like a D9 or a 80 ton excavator they stand no chance. The one pictured was gone the next day. Removing them with a pick and spade is another thing. In another country far far away. A young man from that far away country worked in a neighboring country, where he earned far more than he ever could in his home country. Passports was at that time was not a right but a "gift" from the government to those selected, "to be withdrawn at the discretion of any government official"
The condition for this young man's passport was to be a monthly report on all that he saw in this foreign country. Easy, write about nothing and fill the pages with words that don't mean anything. This seemed to work for the first 6 months or so, until a summons to come and see Mr. Big. Now Mr. B and the YM have never met and neither knew dust about the other. The meeting took place at a private airstrip in the foreign country. No cordial greetings or other pleasantries was involved. Mr. B started to tell the YM exactly what he thought about the reports. All fair and square until this point. Then Mr. B looked up and saw the utter disregard and contempt in the YM's eyes. Constraints were swept aside and a vicious verbal personal attack on the YM was launched. The young man tempered in harsher fires that Mr. B could muster was now openly laughing and then got up, picked up his bag, and left without a backward glance. The passport was never withdrawn even though not even a sham report was ever written again. Interesting. Sounds like a weird way to do government business. KK: Hammer this is what happens when the government becomes the arbiter of all things. hmmmmmm, there is a whole lot more to this story than what you have written. The SNARL as demonstrated by Louis above is responsible for a hell of a lot of dirty underpants. The Snarl travels further than anyone would guess and this is more so when the day is waning. 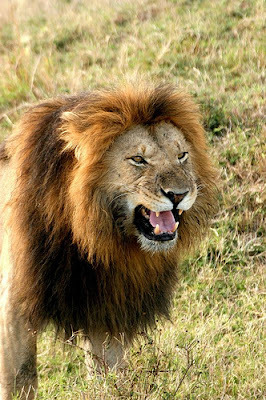 If you are actualy on the spoor of this particular lion and you want to shoot it the Snarl travels even further and penetrates right into your brain. The darker it gets the clearer you can hear the accompanying noises, the Hoarse breath, the twitching tail. By now the lion knows that you mean it harm and from now on out will do anything in its power to harm and kill you first. Ok the sun has set. Sjoe - ek moet se ek kry nog steeds nagmerries van daai aand toe ons hom by tandala gehoor het. This is not a kitty that you want in your back yard - he makes the hairs on the back of your neck stand up - the feeling that you are now quite certain that you are not at the top of the foodchain, in fact you had better find a cave to hide in - The magic of Africa. Gad, he's gorgeous. I need him in my neighborhood. Thank you to England who removed the most arrogant Aussies. Thank you to the All Blacks for CHOKING at the right time, against France. And now we play the Poms again... what were the odds on that! Blacks can dance and play basketball, but not the best at winning the world cup. Look at those sweet angels! Those two are very pretty and playful. Have fun with them. I own four babies of my own. They are SOOOO adorable. You need to put one of 'em onLOL cats. Cute cats. the white one is a born entertainer.